Hi! Welcome to Tiger Cubs! A couple of years ago, my son came home from first grade with a flier that invited him to join Cub Scouts. Now, I was a Cub Scout, so I figure, “Okay--let’s give it a try.” Little did I know…Scouts have their own special language: Scoutspeak. It’s kinda like when you go to a party and everyone there but you is a computer programmer. 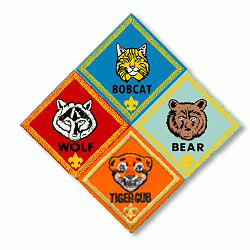 This is the highest ward a boy can earn in Cub Scouting. Also the only non-religious award from Cub Scouts which can be worn on a Boy Scout Uniform. A geographical are, made of up districts for administration of the Boy Scout programs. We are part of Circle 10 council the 5th largest in the country. Any of a million or so boys between the ages of 6 and 11 who get together and have fun at Den and Pack meetings. Marked by curiosity, easy laughter, speed, and blue uniform. Likes to eat DingDongs® and Bug Juice. The Cubmaster is the chief adult volunteer leader. The Cubmaster runs the pack meetings and advices other leaders. Our Cubmaster is Al Solis. Each council is divided into a number of districts. We are in Great Plains District. The largest, most active district in Circle 10 Council. district. Our DE is Rodney Carpenter. with a Tiger Cub to help him Search, Discover and Share the world as he plays and does things with other Tigers and their partners. Most anything you’d never think of. Juice can lids and tissue tubes, bits of string, wood, packing peanuts, wheels, marbles, frosting containers, and whole bunches of stuff that make great craft supplies!